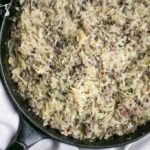 It may come as a surprise that I’ve never made the popular skillet dish made with coleslaw mix and ground beef until now. I decided to make it last weekend and see if it lives up to it’s name. 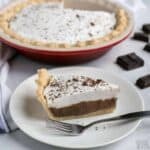 It’s a popular recipe from the Low Carb Friends forum. They named it crack slaw because it tastes so good, it’s addicting. They don’t think crack sounds very appealing as a food. I’d have to agree. Nevertheless, I had a hug head of cabbage in the refrigerator and wanted to find out why the recipe gets such rave reviews. What is crack slaw? 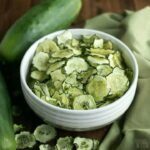 It’s a dish typically made with a bag of coleslaw mix to make things easy, but I find grating fresh cabbage in the food processor is just as easy. 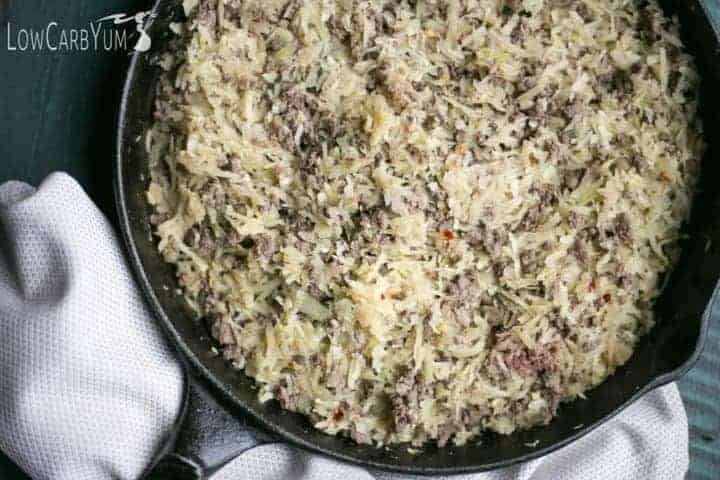 You simply brown up ground meat, set it aside, then fry up the shredded cabbage mix in the same pan. It’s usually seasoned with soy sauce and a sprinkling of spices. 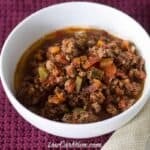 Most people make it with ground beef, but you could use ground turkey or chicken. I grew up on Asian food so almost everything my family ate had soy sauce in it. Since soy sauce usually has wheat in it, I prefer using tamari instead. However, I’ve been moving away from soy all together so I’ve been using coconut aminos which is a bit expensive. You can customize this dish with seasonings that suit your own taste. I like mine a little spicy so I sprinkle on red pepper flakes. You may like it a little sweeter or prefer to leave the sweetener out entirely. The great thing about low carb crack slaw is that it’s such an easy dish to throw together. This makes it perfect for those busy weeknights when you need to get dinner on the table quickly. I often forget how delicious and versatile cabbage is. 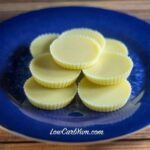 Cauliflower seems to always get the attention as the go to low carb vegetable. But, there are so many things you can do with cabbage. 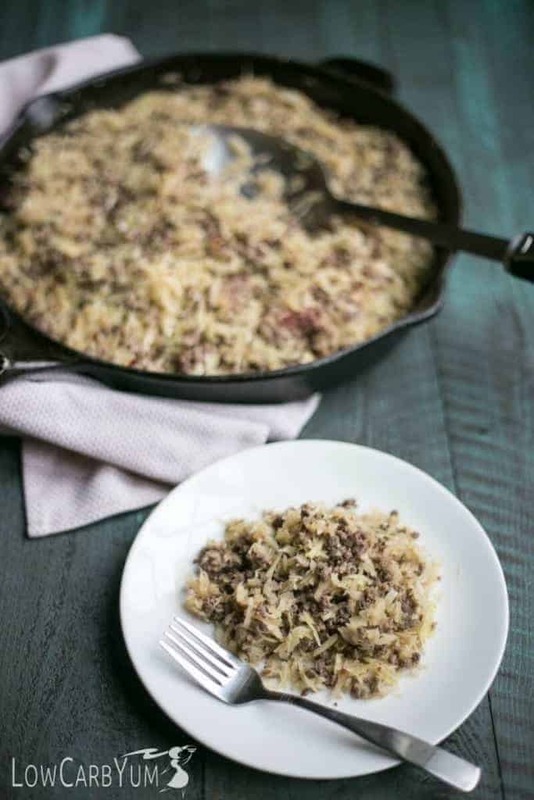 In this dish, the grated cabbage is reminiscent of rice. And, unlike cauliflower, cabbage makes terrific noodles when sliced in long strands! This low carb crack slaw made me realize that I need to eat more cabbage. 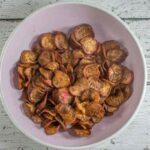 It’s such a great low carb vegetable! Do you eat a lot of cabbage? What’s your favorite way to serve it? My favorite recipes are a creamed beef casserole and coleslaw. But now that I’ve discovered how delicious hot cabbage slaw is, it’s being added to my favorite list of cabbage recipes! It will be a regular in my dinner rotation. 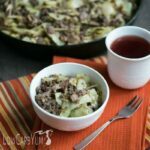 A quick and easy low carb skillet dish made with grated cabbage and ground beef. So good, it can be addicting which is how it got it's name. 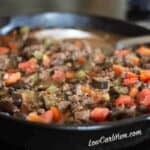 In large skillet or wok, brown the ground beef with garlic, ginger, salt, and pepper. Heat olive oil in skillet. Add cabbage and cook until it begins to brown. Stir tamari, vinegar, stevia and red pepper flakes (if using) into cooked cabbage. Add in browned ground beef and continue cooking until well heated. Made this dish with turkey burger. Not sure it needed the sweetness of the Stevia drops, but it was fantastic, regardless. Also had it in a low-carb tortilla. Will definitely make again! This was ridiculously easy and delish! This will become a staple for sure. Glad it worked out for you. I make it all the time! Quick go to meal, I’ve done egg roll in a bowl b4 & love the fresh flavor of the ginger & garlic. But I thought there was an American version with just onion & garlic powder, salt & pepper. So that’s what I did tonite, quick & tasty. I put a pat of butter on hubbys, it was good! Next ttime I’ll add a fried egg on mine.miss I think I’d like caraway seeds in it but not the hubs. Even my dog luved it! I just made this for the third time. Each time I forget how deliciously wonderful this tastes. Easy to make and easy clean up. It is super tasty! I make it regularly. I use bagged Cole slaw mix, about 1T of sesame oil when cooking the cabbage, and top with diced green onions. Very, very quick and tasty! Did not like at all. Sorry. It’s always a win when the children are eating healthy foods! What didn’t you like about it ? 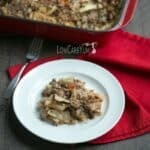 I am curious–I had only 14 oz of cabbage instead of the 24 oz (1 1/2 lbs) and the results were very dry- and quite un-tasty-do you think the lack of cabbage could be at fault? The amount of cabbage wouldn’t matter, but the amount of fat in the meat does make a difference. Hi Lisa! This looks absolutely delicious! I don’t have any stevia on hand, so could I add either some Swerve or Lakanto sweetener? If so, how much should I use to sub for the stevia? You only need about 1-2 teaspoons. -looks good, gonna cook up a batch today! Servings it at the top of the recipe “6 people” and that amount is adjustable by using the slider. I haven’t tried sausage yet, but ground pork is one of my favorite meats to use. This is amazing and my kids love it as well. Works great if you cook the night before, refigerate, and bake at 350 for about 30m the next night especialy on a bsy day!! Great idea of prepping before! Hey Lisa, I made the Crack Slaw last night for dinner, and it was so delicious that I’m having it again for lunch. I’ll be fixing it this evening as well because my husband requested that until further notice I make it every night. So, a big thanks for creating this delicious and nutritious meal! Ha! Great to hear how much you guys like it! This stuff is awesome! 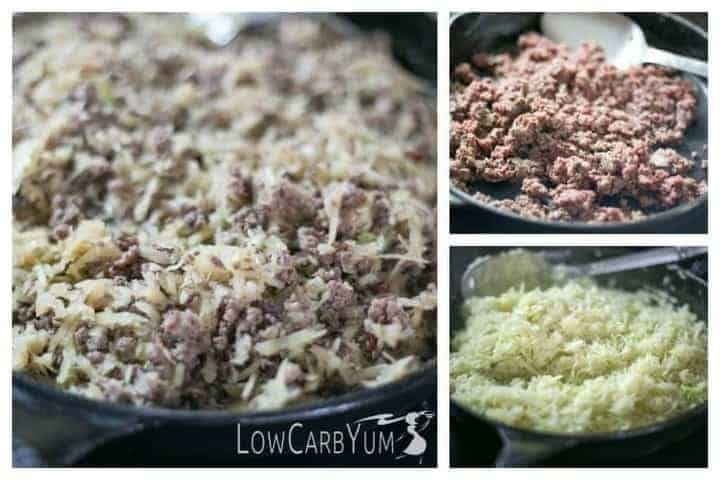 I like using ground pork, it is delicious with the cabbage! Wonderful recipe! Ground pork is my favorite too as it tastes more like an egg roll with it. Curry coconut crackslaw is my favorite and in frequent rotation. 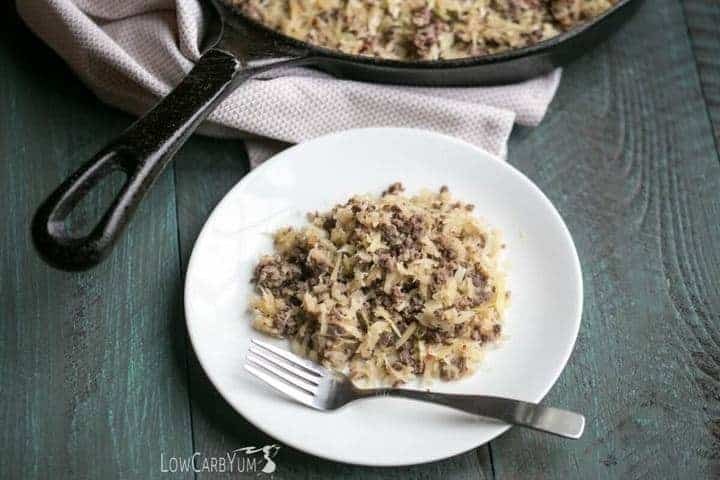 Simply brown onion and meat with your favorite curry powder, then saute shredded cabbage with cocnut oil or olive or avacado oil and curry as well,til softeneing, mix the two, add a can of coconut milk or cream and simmer for a bit, Is extremely delicious, non low carbers also love it. Can make the cabbage less gassy by adding in sautéing with the cabbage 1-3 tsp of cumin seeds. ( if making cabbage roll type crackslaw then caraway seeds serve same fctn and adds grt flavour). This only gets better as it sits in the fridge a day or two and also freezes well. Am gonna try to make it in my instant pot soon also. That sounds delicious. Thanks for sharing! I made this for dinner this evening and added cinnamon and more black pepper. It’s delicious! Sounds interesting with the cinnamon! 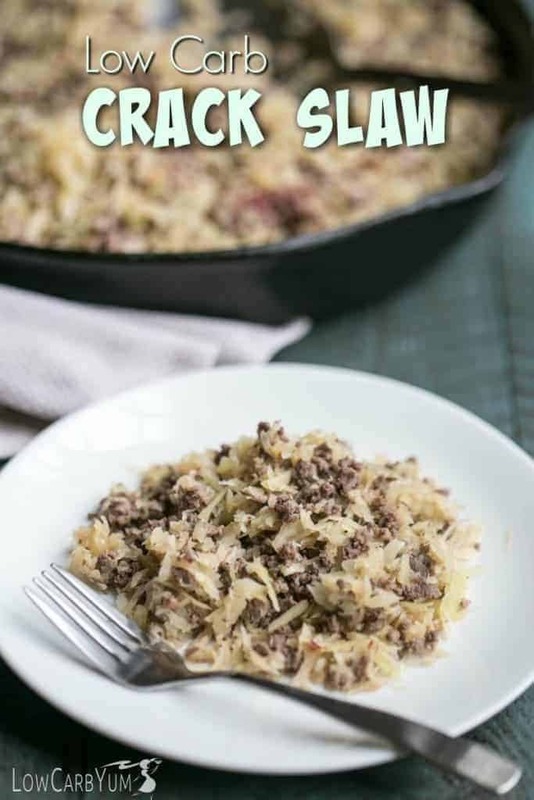 Getting ready to make this and wondering…do you drain the hamburger grease from the meat or leave it in the pan and add the olive oil to it before you cook the cabbage??? I never drain, but typically I use fairly lean ground venison burger. I had never even heard of crack slaw till I started the lchf woe. I have made it a few times now. My husband and I love it. In fact we’re having it again tonight. 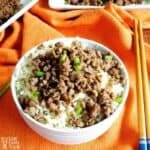 I use ground pork and sometimes add mushrooms. It truly is good with a few onions but not for everyone. This particular recipe is delish. I’m going to give it a try with ground pork. That will make it taste more like the inside of an egg roll. 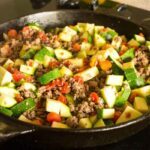 It’s a low carb favorite! I have made something similar but without the sugar and I start with carmelizing onions first (gets me sugar). I have used bacon in place fo the ground meat. I add apples as well as the cabbage. I use the same spices as you recommned. I’ve made a stir-fry cabbage and bacon. Might try it with grated cabbage or coleslaw mix. I don’t use a lot of onion because of the carbs. A little onion powder sprinkled in would be a good add. My version I add about a 1/4 c. finely chopped onion. Its perfect. I caramelize it too, and I don’t add sugar or stevia to mine. But going to try yours and the bacon and pork version sound mouth watering good. Why didn’t I think of that! Thanks. Was thinking bacon with the beef or pork too. Love Bacon. Great ideas, thanks, and its so good for you. Yes, you must give it a try! Bacon is a fantastic add. I have made crack slaw before it is really good . I agree. I’m not sure why it took me so long to make it!